Withdrawn from sale. Interested parties should email to check possible availability. A wakizashi, signed Kawachi Daijo Fujiwara Masahiro. Hawatare: 1 shaku 2 sun 6 bu (38.18 cm / 15.03"). Motohaba: 2.06 cm. Sakihaba: 2.3cm. Kasane: 5 mm. Shinogizukure, iroi mune. Gunome, slightly midare nie based hamon. The jigane is a tight, even itame, with fine jinie. Excellent intact horimono of burning Fudo standing on a lotus, and a ken with a vajra handle on the reverse. Red copper habaki with bonji. 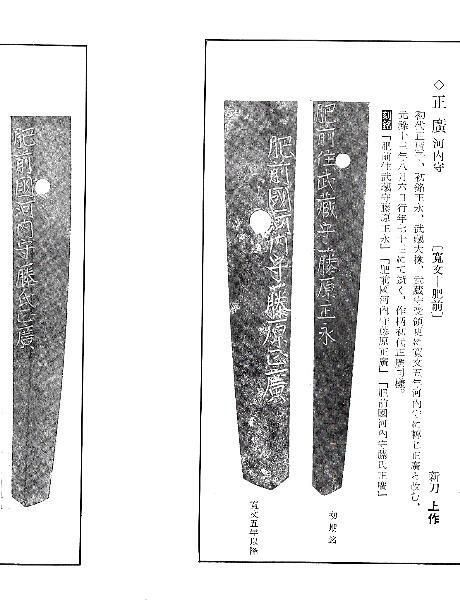 NTHK-NPO work sheet giving the blade 76 points, 80 being their equivalent to NBTHK juyo. Ref. rated josaku in Nihon Toko Jiten - Shinto Hen, by Fujishiro; valued at 5,500,000 yen in Toko Taikan, by Tokuno. 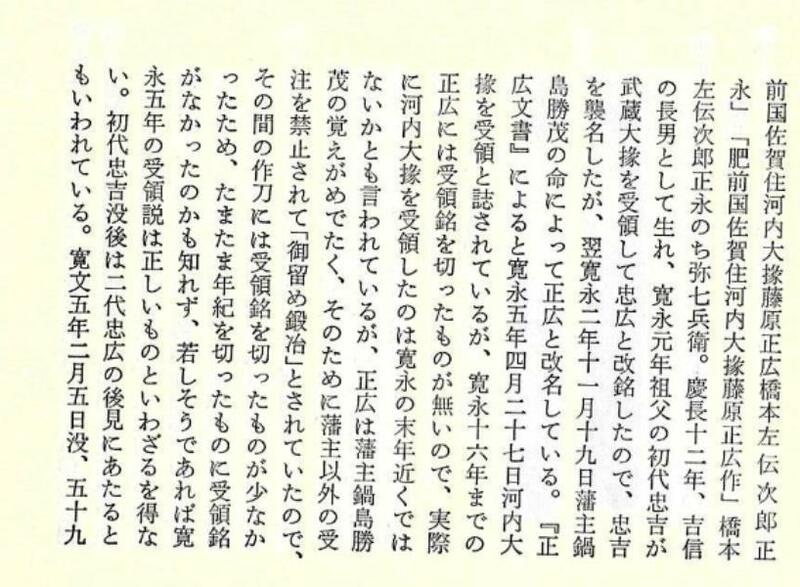 However, in the Heisei 16 edition, he is rated at 7,500,000 yen. Black tsuka ito shibuichi fuchi-kashira, menuki of kabuto with a naginata, and a bow and arrows. The tsuba is a good early Edo Owari sukashi with good iron bones and color. Brown lacquer saya with horn fittings. 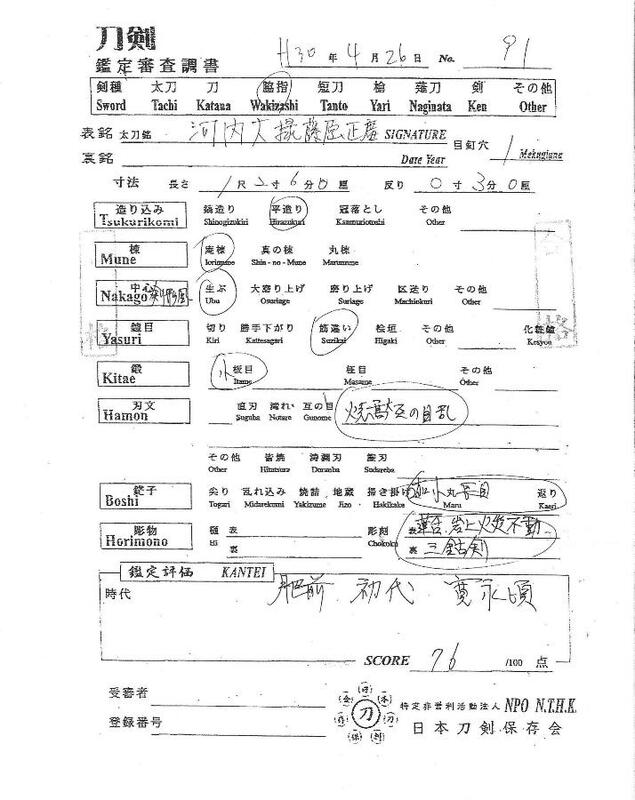 NTHK-NPO work sheet rating 76 points, and specifying first generation.